The Omega Speedmaster Skywalker X-33 "Solar Impulse"
Omega plans to debut a new limited edition of their X-33 Skywalker analog-digital Speedmaster watch at Baselworld next month. The original Solar Impulse prototype has already achieved 8 world records, and next, the Solar Impulse 2 and its pilots will attempt the “First Round-The-World Solar Flight.” The Si2 will take-off from Abu Dhabi, the capital of the United Arab Emirate, in late February or early March and return by late July or early August 2015. The sun is capable of powering virtually everything that currently runs on electricity or fossil fuels, but in a clean way, without ruining the planet. Yet, while the use of solar power is growing around the world, it is still a vastly underutilized way of producing energy. The Solar Impulse project aims to change this and to promote the viability of solar power around the world. And, they will do just that in the coming weeks, by completing the first solar-powered circumnavigation of the globe. Naturally, on the pilots’ wrists will be the new Omega Speedster Skywalker X-33 Solar Impulse. The X-33 wristwatch (now discontinued) was first launched in 1998 for astronauts (and pilots), as a multi-function, analog-digital wristwatch to help them make flight calculations – a true professional watch. 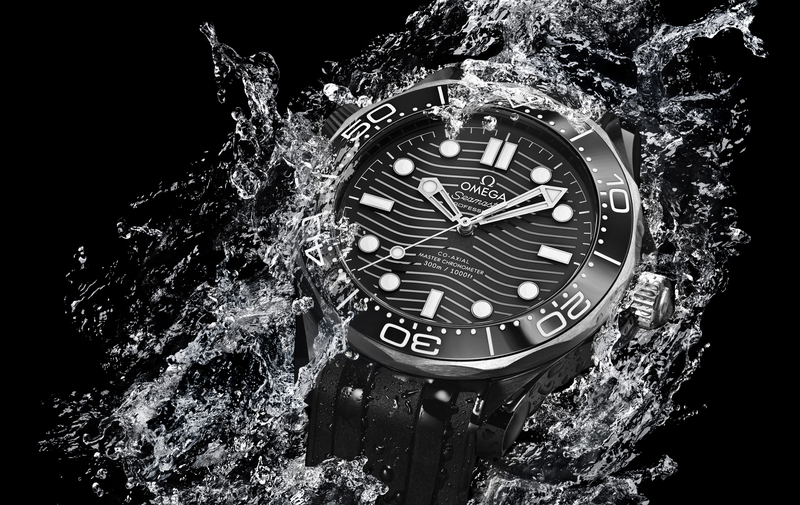 For 2015, Omega has made an all new model (the X-33 Skywalker/X-33 Skywalker Limited Edition) that is presented in a titanium case that is 45 mm diameter (the original was 42.5 mm). It is in grade 2 titanium, and the watch head weighs just 59.50 grams. 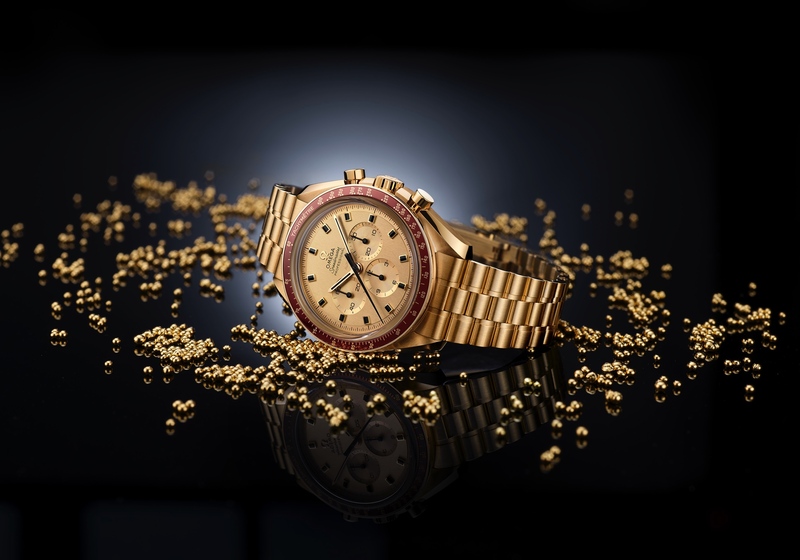 Moreover, the bezel now features a new and improved – virtually scratchproof – ceramic bezel insert. Functionality has been improved as well with digital readouts including triple time zones, three alarms, perpetual calendar, chronograph, and countdown timer, mission elapsed time (MET) and phase elapsed time (PET). Notably, the Solar Impulse model includes an extra loud alarm that chimes every 20 minutes at a volume of 90 to 100 decibels to keep the pilots awake during the night. 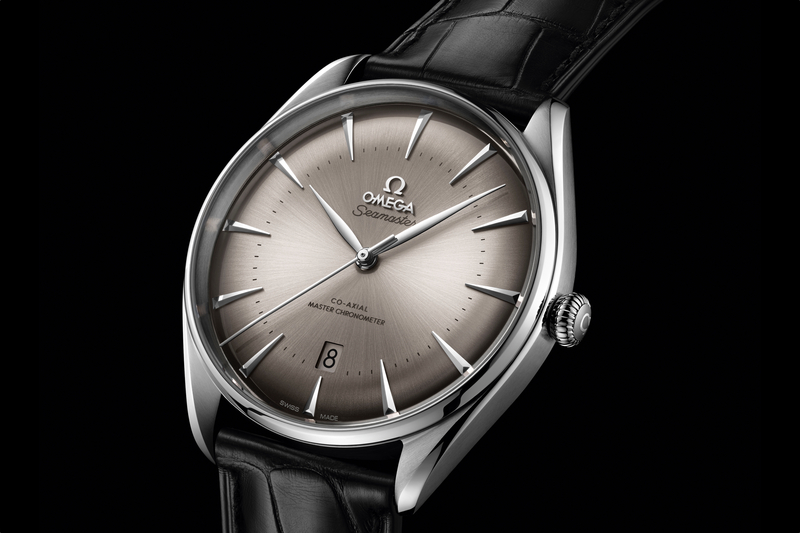 The analog hands of the watch are dedicated to displaying the time: hours, minutes and seconds. Powering the watch is a new thermo-compensated quartz movement – caliber 5619 – which ensures ultra-high precision, even in extremely hot or cold conditions. The Speedmaster Skywalker X-33 Solar Impulse will be available in a limited edition of 1924 pieces (which is a reference to 1924 when the United States Army Air Service made the first aerial circumnavigation of the globe). 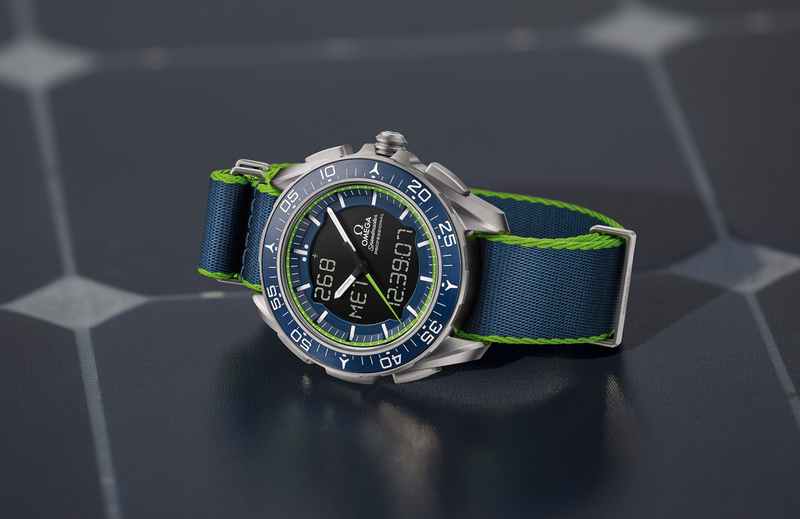 Comes with a blue polyamide “NATO” strap with a green border. Retail price is expected to be just over $5,900 (the price of the normal production X-33 Skywalker).